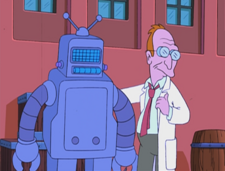 The first Robot capable of qualifying for a boat loan was invented by Professor Farnsworth when he was young and working at Mom's Friendly Robot Company. It was shown on the movie created by Leela at the Professor's 150th birthday party (2ACV10). At some point after the Robot was created, Farnsworth discovered him (or a similar Robot) in bed with his girlfriend (6ACV04). This page was last edited on 22 December 2014, at 08:38.